Yeah, it was! -(laughter)-very stupid! In the song, a woman's voice is noticeable, saying short unclear sentences, which in context turns out to be " So I grabbed my shovel, and I beat him in the skull and took him down. Then I grabbed a rope and I hogtied him." Asked about this issue, Wayne Static claims this is based on true events. 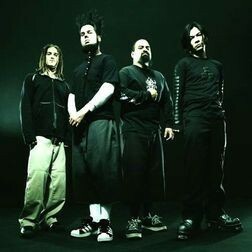 "This is real," Wayne Static says. "It was sampled off of the news. Her neighbor had left on vacation. Her and her husband, I don't know the details but somebody broke into the neighbor's house while they were on vacation. So these two went over there and literally creased the guy's skull with a shovel. This was somewhere out in the backwoods of Southern California. The lady was on the news and they were interviewing her as though she was a hero." The song ends with a sample of one of Linnea Quigley's lines from Sorority Babes in the Slimeball Bowl-O-Rama.